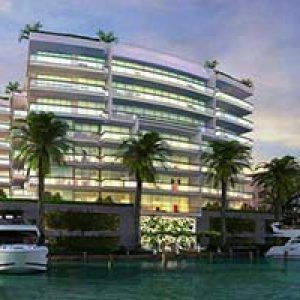 If you are looking for something “new” in luxury living in Fort Lauderdale, look no further than the Nu River Landing. Located at 511 SE 5th Ave., Nu River Landing offers the very best in luxury amenities and a beautiful waterfront view of the Tarpon River. In the heart of Fort Lauderdale’s Las Olas district, Nu River Landing is a 25-story tower with over 20 different floor plans available to fit your lifestyle and budget. Luxury condominiums are available in studio, one, two, and three bedroom floor plans, with a choice of river, ocean, or city views. Studios start at $229k with 634 square feet of living space and range up to three-bedroom models with 1,692 square feet of living space for $625k. You will not find a better value for luxury waterfront living in Fort Lauderdale. Nine-foot ceilings come standard in every unit as well as impact-resistant floor-to-ceiling glass windows. Plenty of natural light, beautiful views, and efficient heating and cooling are just a few of the added benefits of this floor space. Stone flooring, designer lighting, and wood-based moldings provide expansive flow-through design schemes that make your living space seem much larger. Kitchens come equipped with granite countertops and backsplashes, imported Italian cabinetry, and double-bowl stainless steel sinks. Energy efficient, top-of-the-line appliances offer the very best for every chef, amateur to professional. Nu River Landing also provides private covered balconies and the expansive outdoor living space you enjoy the most about Fort Lauderdale luxury condominiums. In addition to the beautiful living spaces at Nu River Landing, residents may enjoy all the very best in amenities you’ve grown accustomed to in a luxury lifestyle. The 25th floor rooftop pool is one of the best places in Fort Lauderdale to relax and entertain guests. A lushly landscaped meditation garden provides the serenity you need in the heart of the bustling Las Olas districts. Work out in the two-story state-of-the-art fitness center complete with a yoga and pilates studio. Indoor basketball and racquetball courts cater to a wide variety of active lifestyles. Relax afterward in the “his” and “hers” steam room, or get some work done in the business center and conference room. All residents at Nu River Landing may enjoy 24-hour security, valet, concierge, and parking. Nu RIver Landing is just steps from beautiful Smoker Park and the bustling Las Olas district complete with a wide range of dining, entertainment, nightlife, and cultural establishments. Just over the river is the Historic Stranahan House Museum as well as the NSU Art Museum. Also just a short distance from Florence C. Hardy Park & Southside Cultural Center, Nu River Landing gives you the option to enjoy the luxury South Florida lifestyle of your dreams. Don’t miss out on this opportunity to own something “Nu” in luxury Fort Lauderdale condominiums.